How can this be? Another giveaway?? So I knit. 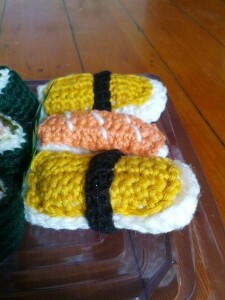 I would consider myself even to be a moderate knitter. I’m ok, but certainly not accomplished. 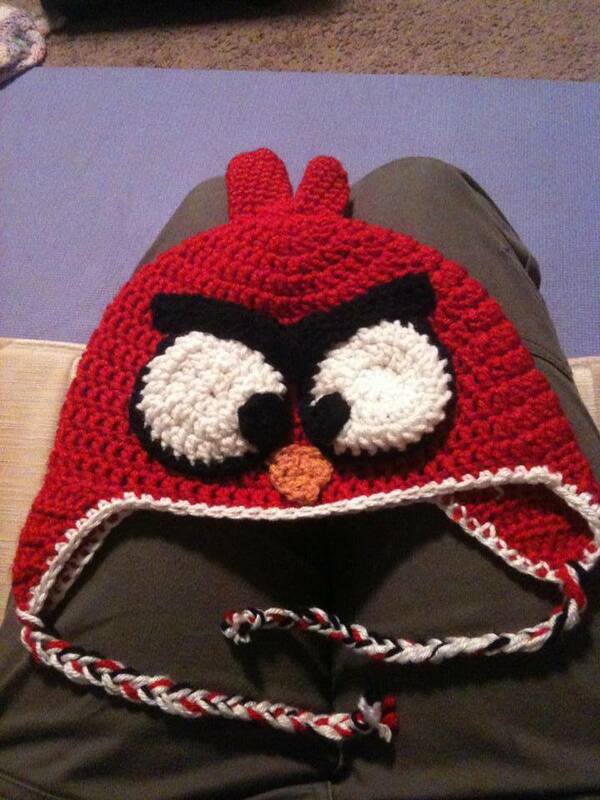 My sister-in-law knit up a storm and now she has turned to crocheting. Her skills have taken off and her prolific crochet hook is moving faster now that I can even keep up. She says she can see a hat and then figure out how to make it. This blows my mind. She’s begun to get requests for certain hats and certain toy foods. And she has kindly crochet a toque that we get to giveaway on our blog here. 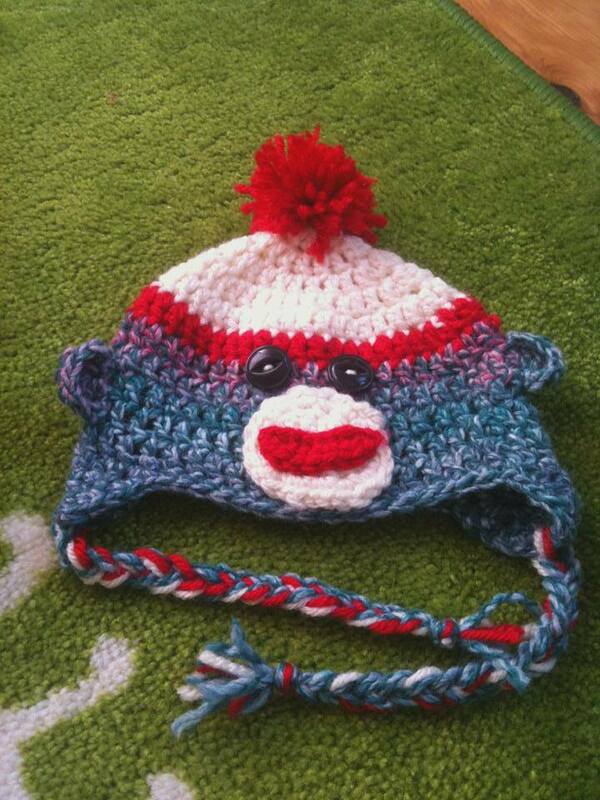 This giveaway is for one newborn size sock monkey hat. Please leave a comment telling me about the baby you want to put this hat on. A comment will be chosen at random in one week and contacted via. email. Comments closed. Congratulations Dayna! You won! Look for your email! A Giveaway from Love and Farkles!! Kari moved to Pender Island a couple years ago and she lives just down the road from me. We do some exercising classes together and our girls play really well together. And she makes this amazing jewelery! Like seriously, beautiful stuff! Her business on Etsy is called Love and Farkles. With Christmas coming up, Kari is like a little Christmas elf, busy filling her stores for all the Christmas orders. And in between all this, she has offered to do a giveaway on my blog. 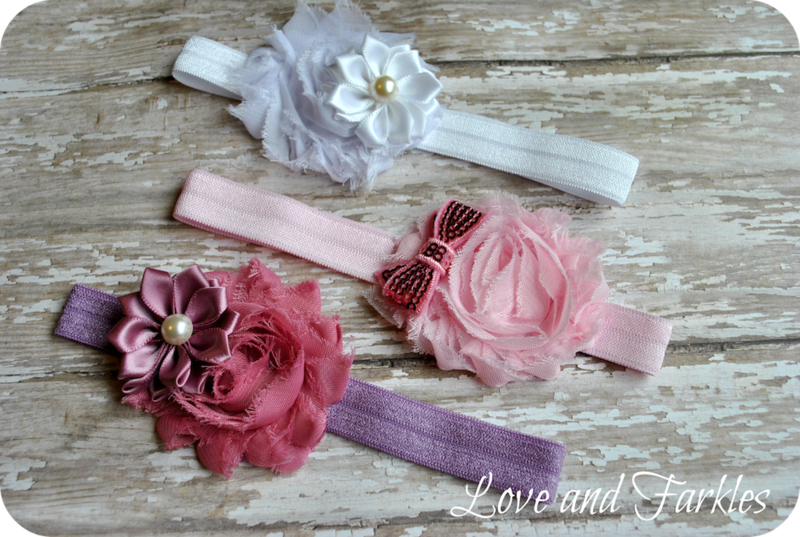 Set of 3 Shabby Chic headbands in newborn-3 month size. In Soft White, Baby Pink and Lavender Rose. 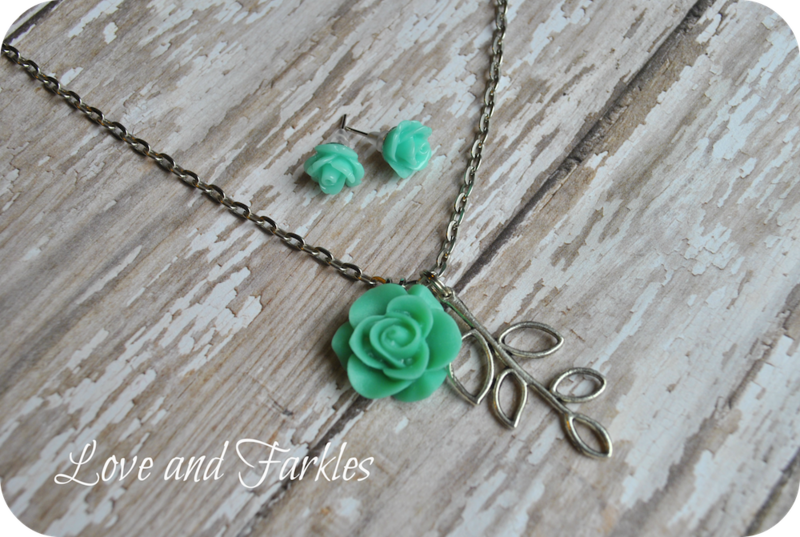 Teal Rose Earring and Necklace set. The chain is an antique silver and includes resin rose and silver leaf charms. Length: 24 inches long. Please leave a comment on the blog to enter this giveaway. A winner is chosen through a random number generator. Winner is Allison Bashaw!! Please look for an email from us! I have a sister-in-law who is very talented. 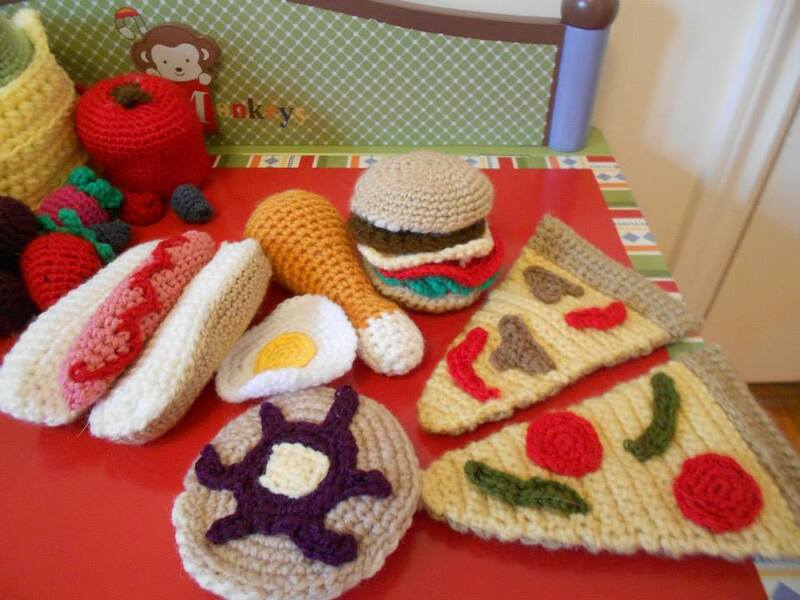 Her name is Danielle and she just loves crocheting things. Anything. Including sushi. Then two days later, play sushi arrives in the mail. But I’m not just bragging about her to hoard her all to myself. I’m not just saying this to say “Look what a cool family I have, now go get your own.” The title of the blog is “Giveaway” after all! So here it is. 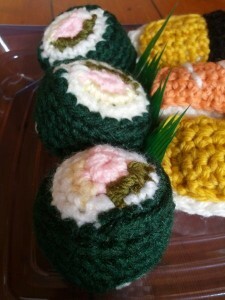 We are giving away one sushi set (three nori rolls and three nigiri rolls) to one winner for St. Patty’s day. 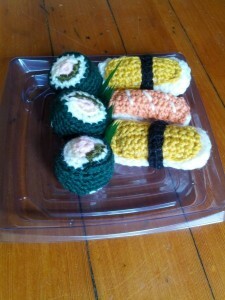 Put a comment on the blog and you will be entered to win this sushi set. Comments close on Friday March 22nd at midnight. The winner will be chosen through a random number generator and will be contacted by the email they leave on the comments, as well as announced on the blog Saturday March 23rd. This giveaway is open to anyone internationally with a mailing address. Thank you, Comments are closed. Congratulations Amy. 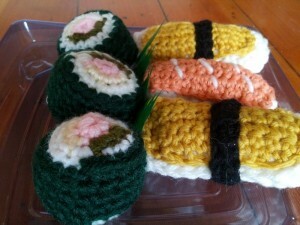 You won this beautiful play sushi set. I have contacted you by email. We have a very dear friend named Wade. I’ve known Wade for at least 10 years and Marc has known him for even longer. This year he started a new venture. 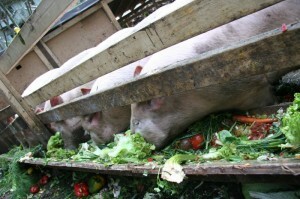 Pig farming. It’s an ironic turn of events that both Marc and Wade are now farmers. Wade has a bachelor of science in psychology and though he says it doesn’t directly help him learn to farm pigs, he says he uses his psychology skills to assess his pigs’ mood when he enters their pen. 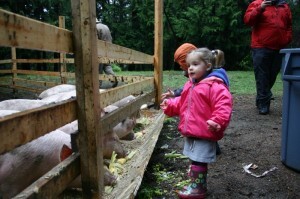 I asked Wade, what made him turn to pig farming? Wade was also suffering from depression. He started his Masters at University of Victoria but was unable to continue because his depression was interfering with his ability to participate in the classes. 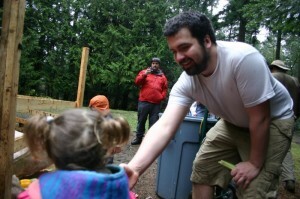 Wade was living at his brother’s place outside of Edmonton working at a construction site when he decided to go visit his parents in Victoria. He found that they had started raising chickens and he thought of ways to expand their livestock. As he began reading about farming, he was so busy, his depression began to subside. 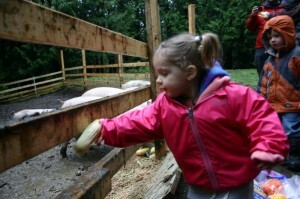 He began researching pigs and soon found a place to buy piglets in Langley. He woke up smiling again, looking forward to seeing his little piglets. 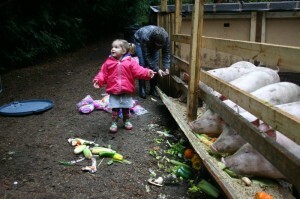 When the piglets were 7 weeks old, he brought them home to live in the garage while he built them a spacious pen in the backyard. The grocery stores throw out so many vegetables every day. The vegetables aren’t rotten or beyond consumption, but they are beyond being pretty enough to sell. These stores were paying to have someone come and pick up all this “garbage.” Now that Wade picks up their vegetables, (600lbs every second day) one of these stores are saving enough money that they hired a full-time employee. 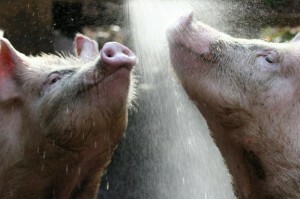 Pig farming is creating jobs, not only for the farmer himself but for others in a trickle-down effect. 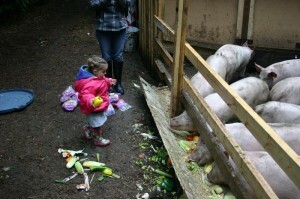 Wade let us come by the farm to feed the pigs. 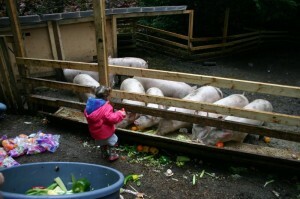 Gabrielle was tickled pink as she threw the produce into the trays and watched the piggies gobble them up. 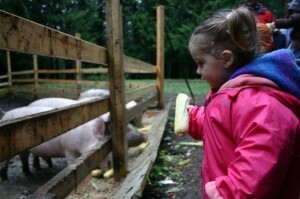 She talked about going back to see the piggies for weeks after. Don’t worry, we will be going back to visit. Especially when Wade gets his next batch of piglets. 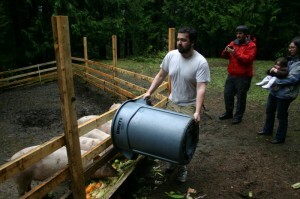 Now the pigs are nearly full size (about 350lbs) and it is time to send them to the butcher. The pigs have lived a happy healthy life and as a meat-eater myself, it eases my conscious greatly to know that my meat was treated well during it’s life. Seeing these pigs in such a humane environment makes me thankful for Wade’s work at raising meat I can feel good feeding to my child. 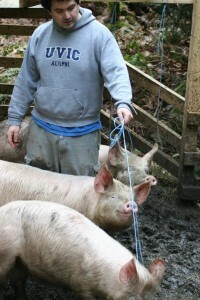 Wade said that raising these pigs has given him such meaning to his life. He wakes up energized and happy in the morning to see their eager faces. He says it has helped so much with his depression and given him a purpose. Because the pigs have given him so much, he wants to give back to the community. 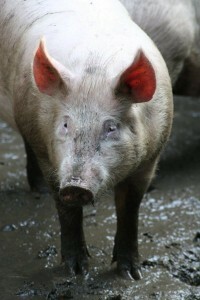 For every pig he sells, he is giving money through World Vision to send a pig to a third world family. And if all this isn’t enough for you to want to jump onto the pork bandwagon, Wade is doing a special promotion through this blog. When you order pork and mention As A Bee blog, you will be automatically entered into a raffle to win 10 extra pounds of meat. 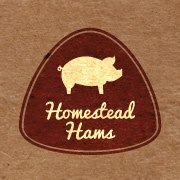 Click on this link Homestead Hams, and you will be directed to a PDF order form where you can order Wade’s pork for yourself. One quarter is approximately 60lbs of meat for $300. 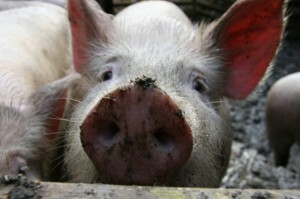 Remember, you will be automatically entered to win 10 extra lbs of pork if you mention As A Bee Blog. This offer is only available to people on Vancouver Island, Vancouver mainland and the Gulf Islands. This giveaway is only available while the product lasts so order soon so that you don’t miss out on this great deal!